Casino slots are interesting when they are colourfully themed and powered by features that help you win big. Prosperity Twin is one such slot with a rich and traditional ancient Chinese theme of wealth and treasure to help you prosper. This 3 rows, 5 reels game offers 243 different ways of winning. The reels are set in the backdrop of mystic mountains with magical waterfalls below them. The bright blue background makes the symbols with golden ornaments look attractive. The ancient Chinese music in the background sounds very soothing to the ears and it keeps your focus intact. The betting of this game is between the range of £0.28 and £100 per spin. This colourful rich slot game was developed by NextGen, an innovative casino gaming company. They have a wealth of knowledge and experience spanning over two decades that has made them one of the top developers in the world. Their games come with highly rewarding features and are playable on latest mobile devices as well. What makes a slot game look attractive are its symbols and Prosperity Twin slots of various Chinese artefacts as symbols. You can find a sailboat with precious gold around it, two different treasures chests with gold ornaments, an abacus, a fish made out of gold and a green bracelet. You can also find playing card symbols of heart, club, spade and diamond in the form of gemstones with a golden outline. The symbol that pays you the highest reward is gold sailboat that gives 288 times your stake on five symbol win. There are two additional symbols that trigger bonus features and they are three gold coins and a Chinese symbol in the gold frame. 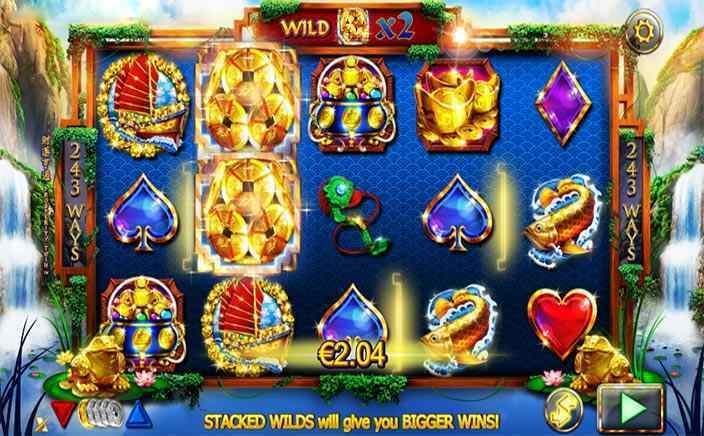 Precious Wild: The three gold coins over a gold frame is the wild symbol of Prosperity Twin slots. It appears on all the reels and can land in a stacked manner as well. All your winnings with wild are multiplied by 2 or 8 times depending on its appearance. Golden Scatter: The Chinese symbol for gold is the scatter feature here. With three, four or five appearances, you can win 8, 18 or 28 free spins. During free spins, two scatter appearances can give you further 2, 6 or 8 spins. Five of its kind even gives you coin win of 288 times on your stake. 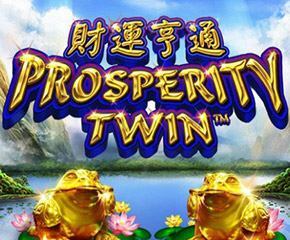 With precious gold everywhere that adds more glory to the theme of the game, Prosperity Twin slots is definitely the one that helps you win big rewards.